Percona Server release 11.0 which we announced few days ago unfortunately was released with a bug introduced while implementing stripping comments in query cache which could cause server crash with certain types of queries if query cache is enabled. We have released Percona Server release 11.1 which includes a fix for this issue. If you can’t perform upgrade promptly you can disable query cache until you can do this. We’re sorry for shipping release with such bug. MySQL Query Cache works by checking incoming queries if they may be found in query cache – this is done by performing simple check if query is starting from SEL or comment. After Query is parsed and executed MySQL stores results for SELECT queries in Query Cache. There are cases when queries will not be considered as cachable query during first check, however result for them will be stored in the query cache. This rare case was not handled properly in the new feature added and it was causing MySQL to crash. The most typical case for queries causing issues would be queries starting with brackets and having space before select such as ( select * from t1 ) Queries starting with brackets are often used with UNION queries. This post is the second of a series that started here. The first step to build the HA solution is to create two working instances, configure them to be EBS based and create a security group for them. A third instance, the client, will be discussed in part 7. Since this will be a proof of concept, I’ll be using m1.small type instances while normally, the mysql host would be much larger. Using another type is trivial. I will assume you are using the command line api tools, on Ubuntu, install “ec2-api-tools”. The use of these tools simplifies the expression of the command compared to the web based console. From now, I’ll always assume the EC2_CERT and EC2_PRIVATE_KEY environment variables are setup in your shell. Next, we need to authorize some communications for the security group. I’ll authorize 3306/tcp (MySQL) from hamysql, 694/udp (Heartbeat) from hamysql and 22 (SSH) from everywhere. You can be more restrictive for SSH if you want to. Now we can start creating our instances. Since this is only a proof of concept, I’ll built 2 m1.small instances, fell free to use other types. At the time I wrote this, the following AMI seems ok. I don’t know about you but I don’t like multi-lines output so I wrote a small filter script to on one line the parameters I need separated by a delimiter. which is to my opinion easier to manipulate. Now, let’s configure Heartbeat. The first thing to is to set up the hostname on both host. Heartbeat identifies the host on which it is running by its hostname so that’s mandatory step. Then we can proceed and configure Heartbeat, Pacemaker will come later. Heartbeat needs 2 configuration files, /etc/ha.d/authkeys for cluster authentication and /etc/ha.d/ha.cf which is the configuration file per say. On both host, the chosen key in the authkeys file must be identical and good way to generate unique one is to run “date | md5sum” and grab a substring from the output. Let’s review briefly the configuration file. First we have setup “autojoin none” that means no host not listed explicitely in the configuration file can join the cluster so we know we have at most 2 members, “monitor” and “hamysql”. Next is the ucast communication channel to reach the other node and the timing parameters. “warntime” is a soft timeout in second that logs the other node is later while “deadtime” is the hard limit after which heartbeat will the consider the other node dead and start actions to restore the service. The “initdead” is just a startup delay to allow host to fully boot before attempting actions and “crm respawn” starts the Pacemaker resources manager. Finally, we have the two “node” declarations” for the cluster members. We can also use the “crm” tool to query the cluster status. The package install MySQL has an automatic startup script controlled by init (new to lucid). That’s fine, I will surprise you but Pacemaker will not manager MySQL, just the host running it. I’ll also skip the raid configuration of multiple EBS volumes since it is not the main purpose of this blog series. Upcoming in part 3, the configuration of the HA resources. Percona Server version 5.1.47-rel11.0 is available for download now. Percona Server is now based on MySQL 5.1.47, and XtraDB is now based on InnoDB plugin 1.0.8. XtraDB now uses the fast recovery code released in InnoDB Plugin version 1.0.8, instead of Percona’s earlier fast-recovery code. Added the –percona_innodb_doublewrite_path option to place the double-write-buffer into its own file (issue #584299). The feature is sponsored by Large Social Network website. Added the –suppress_log_warning_1592 option to disable logging of error code 1592. Added the –microseconds_in_slow_query_log option to use microsecond precision for the slow query log’s timestamps (issue #358412). Added the –use_global_log_slow_control option to control slow-query logging globally without restarting, similar to –use_global_long_query_time. Added the –query_cache_strip_comments option to strip comments from query before using it in query cache. Added a global Innodb_deadlocks counter to SHOW STATUS, based on a patch by Eric Bergen (issue #569288, issue #590624). Added more tests to the MySQL test framework. “Percona-Server” is a name of the product. Together “Percona-Server-server-51” is the package name. Percona Server obsoletes Percona XtraDB both on rhel and debian paltform. To install RPM or DEB package from Percona repository you just have to do “yum install Percona-Server-server-51”. If there is Percona-XtraDB installed it will be replaced by Percona Server. However Percona-Server doesn’t obsolete MySQL, so you have to deinstall it first. Conflicts are inevitable otherwise. If there are MySQL dependant applications already installed, you might want to install Percona Shared Compat package before installing Percona Server. The latest source code of Percona Server, including development branch you can find on LaunchPAD. Please report any bugs found on Bugs in Percona Server. Hopefully, I should be able to write those posts quickly but since consulting is my primary duty, I don’t have much control over my workload. As I understand it, there is some historical context to the choice of names here, hearkening back to before I was involved with MySQL, way back when it was a wrapper around ISAM tables — or even earlier, I don’t know. (Unireg, anyone?) In any case, these two variables deserve a little explanation. Both counters indicate the number of times the corresponding storage engine API function has been called. In olden times, the storage engine API was called the handler API, which is why the variables begin with Handler_. Handler_read_rnd counts the number of times the handler::rnd_pos() method is called. This method fetches a row from a table based on a “fixed position,” i.e. a random-read. What this actually means varies between storage engines. For MyISAM, position really means a byte offset from the beginning of the file. For InnoDB, it means to read a row based on a primary key value. Handler_read_rnd_next is incremented when handler::rnd_next() is called. This is basically a cursor operation: read the “next” row in the table. The operation advances the cursor position so the next time it’s called, you get the next row. The naming convention probably doesn’t make as much sense today as it did historically. Monty told me that “rnd” meant “random,” but now I can’t find a reference to that conversation. In any case, one of the operations is basically a random read (if you think of tuples as having a natural order, which historically they did), and the other is just a read-next operation; there’s nothing random about it, really. I would welcome any corrections from those who know more about this than I do. Why would either of these be called? Usually Handler_read_rnd is called when a sort operation gathers a list of tuples and their “position” values, sorts the tuples by some criterion, and then traverses the sorted list, using the position to fetch each one. This is quite likely to result in retrieving rows from random points in the table, although that might not actually result in random IO if the data is all in memory. Handler_read_rnd_next is usually called for each row of a full or partial table scan. PS: I’m being a bit vague about the sort-and-fetch algorithm; there are really two algorithms, and they are smarter than I’m giving them credit for. But that’s a topic for another blog post. EXPLAIN EXTENDED can show you what the MySQL optimizer does to your query. You might not know this, but MySQL can dramatically change your query before it actually executes it. This process is called query rewriting, and it is a part of any good SQL optimizer. EXPLAIN EXTENDED adds a warning message to the EXPLAIN output which displays additional information, including the rewritten query. To take a look at EXPLAIN EXTENDED, I’ll start with three empty tables. It is important to note that the tables are empty because the MySQL optimizer treats empty tables (and incidentally, tables with only one row) differently than tables which contain more than one row. More about that in a bit. You might notice a few odd things about this EXPLAIN. First, there are no tables listed. Taking a look at the Extra column we see that MySQL mentions ‘const’ tables. A ‘const’ table is a table that contains 0 or 1 rows, or a table on which all parts of a primary key or unique key lookup are satisfied in the where clause. If a ‘const’ table contains no rows, and it is not used in an OUTER JOIN, then MySQL can immediately return an empty set because it infers that there is no way that rows could be returned. MySQL does this by adding the WHERE clause in the query with ‘where 0’. Let’s now look at what happens after the value (1) is inserted into each of the tables. Each table contains only a single row, and the value in each table is 1. You should now notice that the tables are actually listed in the EXPLAIN output, but also notice that the type field is set to ‘system’. A ‘system’ table is a special case of ‘const’ table which is used when a table contains only one row. The contents of these tables are read before the query begins executing. Because of this, MySQL can compare the constant values before completely formulating the plan. You will notice the MySQL replaces the WHERE clause with ‘where 1’ because it knows that all the const tables contain equal values. If they did not, the above plan with the ‘where 0’ would be generated. The type field has now changed to ALL, which means that the entire table will be read. This is because these tables contain no indexes. There is another interesting thing, and I probably should have mentioned it before. You will notice that the query that I explained used the comma syntax, but when MySQL rewrote the query it switched it to use the JOIN keyword. This should put to rest any debate as to any perceived performance difference between comma join and ANSI JOIN syntax. They are intrinsically the same. Last, EXPLAIN EXTENDED can show you information about the query rewrites that MySQL makes when accessing views which use the MERGE algorithm. The most important thing to notice is the WHERE clause. You will see that the SELECT statement used in the view has been modified to include the WHERE clause that I used when accessing the view. In my talk on MySQL Conference and Expo 2010 “An Overview of Flash Storage for Databases” I mentioned that most likely there are other players coming soon. 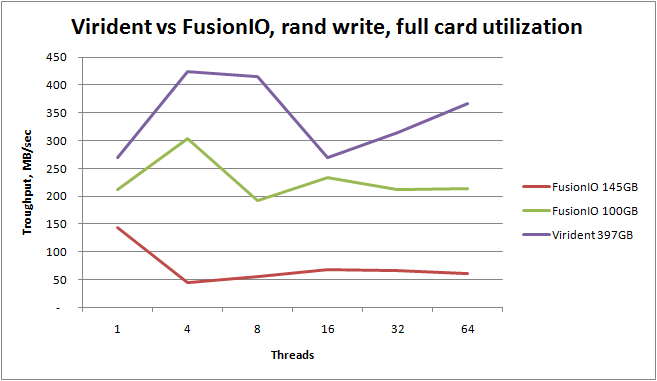 I actually was not aware about any real names at that time, it was just a guess, as PCI-E market is really attractive so FusionIO can’t stay alone for long time. 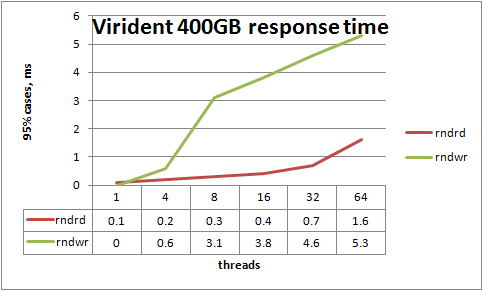 So I am not surprised to see new card provided by Virident and I was lucky enough to test a pre-production sample Virident tachIOn 400GB SLC card. I think it will be fair to say that Virident targets where right now FusionIO has a monopoly, and it will finally bring some competition to the market, which I believe is good for the end users. I am looking forward to price competition ( not having real numbers I can guess that vendors still put high margin in the price) as well as high performance in general and stable performance under high load in particular, and also competition in capacity and data reliability areas. “garbage collector” activity, which requires space to operate and Virident card already has enough space reservation to get stable write performance even when the disk is almost full. As for reliability, I think, the design of the card is quite neat. 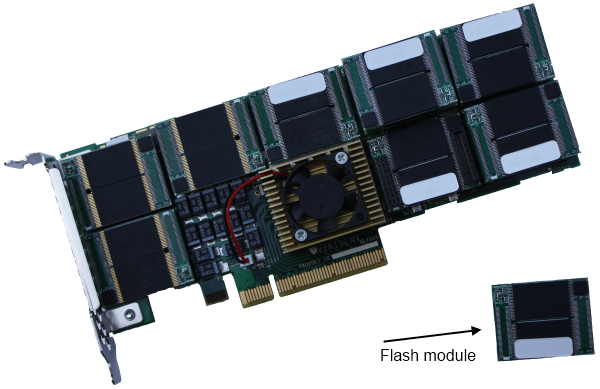 The card by itself contains bunch of replaceable flash modules, and each individual module can be changed in case of failure. Also internally modules are joined in RAID (it is fully transparent for end user). Now to most interesting part – performance numbers. 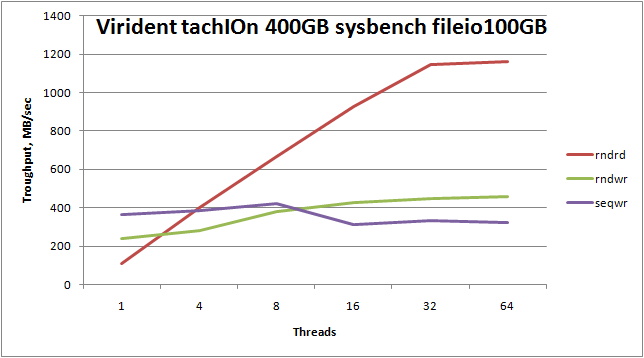 I took sysbench fileio benchmark with 16KB blocksize to see what maximal performance we can expect. with response time below 3.1ms (for 8 threads) and 3.8ms (16 threads) in 95% of cases. it corresponds to garbage collector activity and will be fixed in the production release of driver. I took FusionIO ioDrive 160GB SLC card, and tested fully formatted card (filesize 145GB), card formatted with 25% space reservation (file size 110GB), and Virident card 390GB filesize. It also allows us to see if Virident tachIOn card can sustain write in fully utilized card. 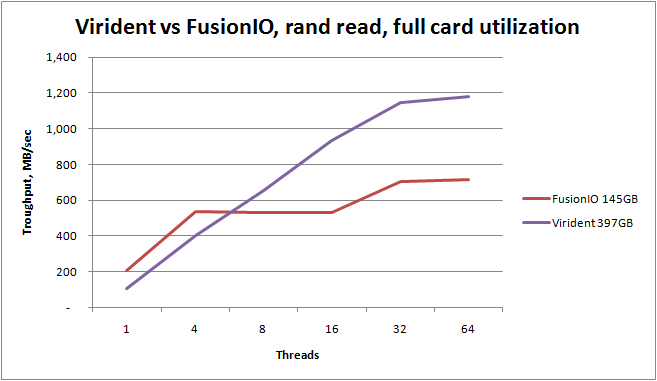 As disclaimer I want to mention that Virident tachIOn card was fine tuned by Virident engineers, while FusionIO card was tuned only by me and I may not have all knowledge needed for FusionIO tuning. cost hit ( 25% space reservation -> 25% increase $/GB). I am looking forward to present results in sysbench oltp, tpcc workload, and also in FlashCahce mode. I just wrote a large post on reasons for innodb main tablespace excessive growth and I thought it would make sense to explain briefly of why it is so frequently you have purge not being the problem at all and when out of no where you can see purge thread being unable to keep up and undo table space explodes and performance drops down. Here is what happens. When you have typical OLTP system with small transactions your UNDO space is small and it fits in buffer pool. In fact most of the changes do not need to go to the disk at all – the space for undo space is allocated, used and freed without ever needing to go to the disk. Now when you have spike in writes or long running transactions which increases your undo space size it may be evicted from buffer pool and stored on disk. This is when problems often starts to happen. Now instead of purge thread simply operating in memory it has to perform IO which slows it down dramatically and makes it unable to handle amount of changes coming in. The solution to this problem may range from pacing the load (which is helpful for batch job operations as it can be controlled), using innodb_max_purge_lag or enable separate purge thread (or threads) via innodb_use_purge_thread if you’re running Percona Server. So you’re running MySQL With innodb_file_per_table option but your ibdata1 file which holds main (or system) tablespace have grown dramatically from its starting 10MB size. What could be the reason of this growth and what you can do about it ? There are few things which are always stored in main tablespace – these are system tables, also known as data dictionary – table and index definitions and related stuff, double write buffer, insert buffer which temporary stores records to be inserted in the index tree and undo segment holding previous versions of changed rows. The system tables size depends on the number and complexity of the tables you have in the system. If you have hundreds of thousands of tables it may consume gigabytes of space but for most installations we’re speaking about tens of megabytes or less. Double Write Buffer is fixed size (2MB = 128 of 16KB pages) and so will not affect growth of your main Innodb Tablespace. Insert Buffer size is also restricted to half of the buffer pool size (can be changed via innodb_ibuf_max_size option) which can be significant size for systems with large amount of memory. Finally undo space can grow unbound depending on your transaction size. The challenge is both Insert buffer and undo space will grow and shrink during the database operation and unless you can them on being large your would not know what caused your system tablespace size to explode – they will shrink to the normal size and all what you have will be free space, which you unfortunately can’t reclaim without reloading tour database. This is where Trending can help, for example MySQL CACTI Templates will have the graphs you need. In this case we can see the segment is allocated to 173551 pages which is about 2.7GB only about 2/3 of it is in use right now but for sake of monitoring tablespace size you need a full allocated number. In this case the History Length is about 4 million which means there are 4 million of transactions which are not yet purged. This is not very helpful as single transaction may modify single row and so be responsible for one undo entry or it may modify millions of rows. Row size can also vary a lot. For many OLTP applications though which have a lot of tiny transactions this is a very good indicator. curr_size will display the current size of RSEG which defines undo segment size, though there is a complex data structure and you can’t easily convert this number to number of data pages for undo slots or number of rows stored. Running Transaction which does a lot of changes – If transaction modifies a lot of rows it has to use a lot of space in undo segment and there is no way around it. Be careful in particular with update or delete transactions which go over a lot of rows. In many cases doing such processes in chunks, updating/deleting may be thousands of rows per transaction may be better if your application can handle it. Note ALTER TABLE will not require excessive amount of undo space even for very large tables as it internally commits every 10000 rows. Running Very Long Transaction If you’re running very long transaction, be it even SELECT, Innodb will be unable to purge records for changes which are done after this transaction has started, in default REPEATABLE-READ isolation mode. This means very long transactions are very bad causing a lot of garbage to be accommodated in the database. It is not limited to undo slots. When we’re speaking about Long Transactions the time is a bad measure. Having transaction in read only database open for weeks does no harm, however if database has very high update rate, say 10K+ rows are modified every second even 5 minute transaction may be considered long as it will be enough to accumulate about 3 million of row changes. Purge Thread Falling Behind This is the most dangerous reason. It is possible for database updates happen faster than purge thread can purge records when they are no more needed which means undo space can just grow until it consumes all free space (or specified max size for ibdata1 file). “Good” thing is performance typically starts to suffer terribly well before that and it gets noticed. There are to things you can do about this problem first you can use innodb_max_purge_lag to make a threads doing modifications slow down if purge thread can’t keep up. This however does not work in all cases. If you’re running XtraDB you can also use innodb_use_purge_thread to use dedicated purge thread, which works a bit faster as it does not need to compete with other activities of main theread. You can also use more than one purge thread by setting this variable to higher values though this functionality is a bit experimental. One related question I get asked often is why Master and Slave may get so much different table space size in the end. The answer is of course their workload is very different. On one hand slave has all updates going from one thread so it has less chance for purge thread to fall behind, on other a lot of people use slave for very long queries which may make long transactions reasons a lot more likely. So it can be both – either master or slave can have it main tablespace growing larger than its counterpart. Writing this blog post I also discovered even in XtraDB we do not have as much transparency in regards to undo space and purging as I would like. I filed number of feature requests and I hope we’ll have a chance to fix this soon. This output gives us an impression Innodb has taken table lock on test/t1 table and many people tend to think Innodb in fact in some circumstances would abandon its row level locking and use table locks instead. I’ve seen various theories ranging from lock escalation to using table locks in special cases, for example when no indexes are defined on the table. None of this is right. In fact Innodb uses Multiple Granularity Locking and there is always lock taken on the whole table before individual locks can be locked. Such locks are called intention lock, hence abbreviation IX = Intention eXclusive. Intention locks do not work the same way as table locks – Intention exclusive lock does not prevent other threads taking intention shared or even intention exclusive locks on the same table. What does Intention mean ? Just what it says. If Innodb sets intention exclusive lock on the table this means it plans to lock some of the rows in exclusive mode. What would these be used for ? They are used to be able to handle operation on the whole table – for example to drop the table you need to lock it exclusively. So do not worry intention table locks you may observe in SHOW INNODB STATUS output, they almost never would be cause of your lock waits or deadlocks.